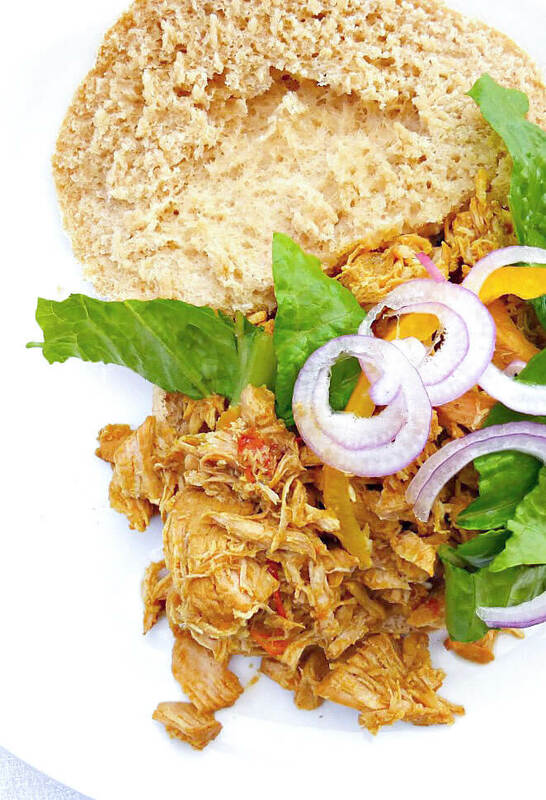 This healthy, simple tandoori-inspired Crockpot pulled chicken is a great midweek meal. I love pulled chicken made in the crockpot and usually go for classic BBQ smoky flavours. However, this time I fancied something a little different and was very inspired by the idea of pulled chicken with an Indian theme after spotting this recipe on The Big Man’s World. If you’re tired of your regular pulled chicken (or pork) then this recipe will give it a delicious face-lift. 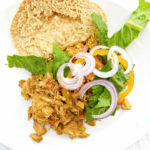 Throw it in some homemade wholemeal flatbreads add a colourful salad and a little tzatsiki, and you have yourself a simple, delicious, healthy meal. Mix the spices together in a bowl. Heat the olive oil and fry the onion until softened. Add in the ginger and garlic and fry for a further minute. Next add the spices and fry for one minute and then throw in the chicken and cook until just browned on the outside. Transfer everything to a Crockpot or slow cooker and add in the water, tomato and cream. Cook on full power for around two hours and then reduce to low for the remaining time (I usually cook for around 6-8 hours in total), stirring every now and again. Serve with rice or bread.